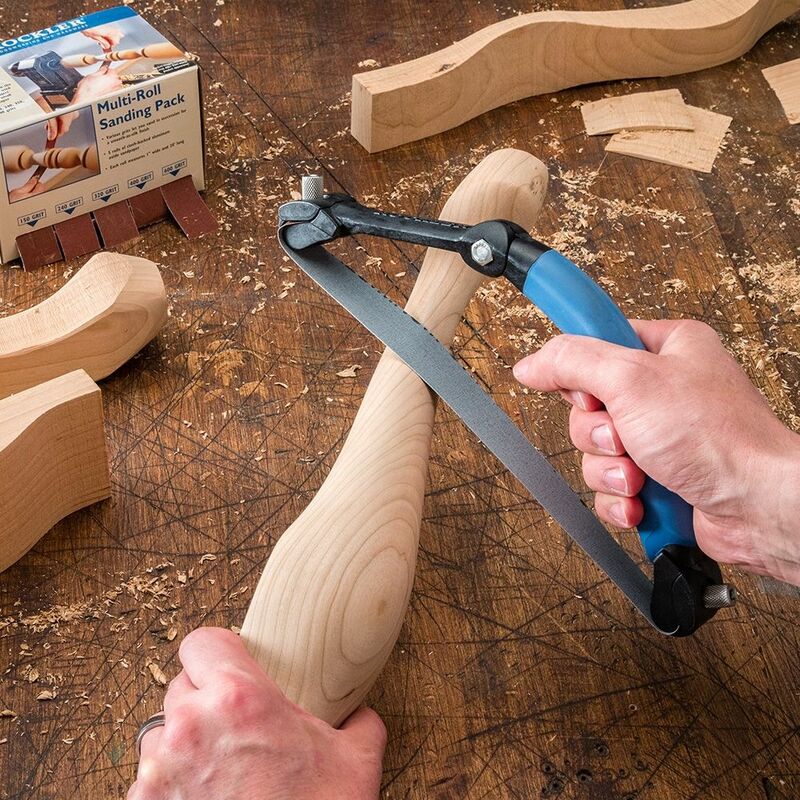 Comfortable bow-shaped handle takes the strain off your fingers—ideal for curved and contoured workpieces! Terrific on long, flat sections on the lathe. Smaller curves, not so much, and using genetic drum sander paper on it is great. It does every thing it ‘s designed to do.I like the tool very much,once again Rockler has hit a homerun. Well built but hard to get teeth to probe the sandpaper. Good for curved areas. Works very well on turnings and finishing solid edging on plywood. Quick to setup and keeps fingers away from spinning wood. I've just started carving spoon ,and this is the perfect tool for sanding them. Had planned on making one but this was a much better choice. Have found that cutting some bands ahead in varied grits is nice,may on my next Rockler order may purchase a second one and keep two grits ready to rock and roll. Works great for rounding handles and more. 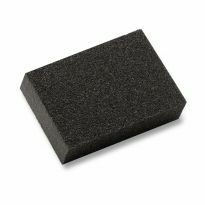 This is an excellent product and with the sandpaper pack, it works well. I think that this is a very good tool to have in the tool box. I make knife scales for knife blanks. I bought 3 of these sanding bows so I can have a different grit sandpaper on each. I can clamp the scales down and switch back and forth depending on which grit I am wanting to use. I think that they are going to make the sanding time easier and shorter. 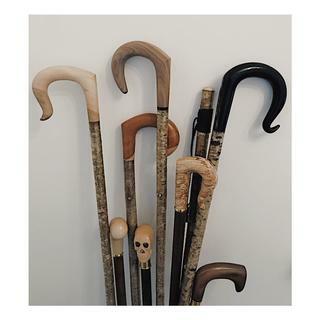 I finish walking sticks that have been spiral formed by honeysuckle vines. the bow sander makes the job much easier. This tool is great for sanding objects on the lathe - no more burnt fingers! This is a very well made tool. It seems to do the job it was designed to do. Well thought out, with good planning!!! Well constructed, using quality parts. Excellent tool. Used it the first day I got it and found it easy to use with outstanding results. In fact, I liked it so much that I bought one for my son for xmas. 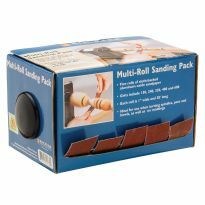 Strongly recommend you buy the multi roll sanding pack to use with this product. 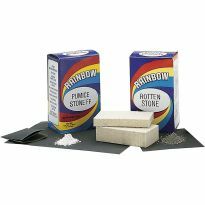 It is real time saver and offers the needed grits for your projects. I saw the need and got one. Use it to shape knife handles. Sure saves my finger tips. Rounds of the square shoulders and makes it easier and faster to keep things even and balanced. This item works great on my lathe. It conforms to the bowl or spindle shape nicely. So much better than holding the sandpaper by hand. I would highly recommend this for lathe work. I was very skeptical when I was browsing the store & I almost purchased two, one for home and the other for work. I only have a roll of 1 1/2” sandpaper strips and “This Thing Rocks!! !” Jobdown time to tinker on project but I will definitely get a second one. Bought the saw while on Holiday in the US, nothing like this in the UK. It is absolutely perfect for profile sanding wooden and horn walking stick handles, rather than loose sandpaper. Good tool needs better loading instructions. 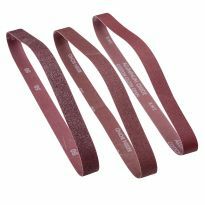 Very difficult to load sanding strips. Instructions for loading are not complete. Is the sanding strip supposed to sag or be taugh? Once loaded the sander works very well. I'd give it 5 stars, but I have one slight nit to pick. I wish the bolts were a quarter inch longer to make it easier to install paper. i'd still buy it again. Effective tool. But, difficult to load/tighten. And, needs special clothed back sandpaper. 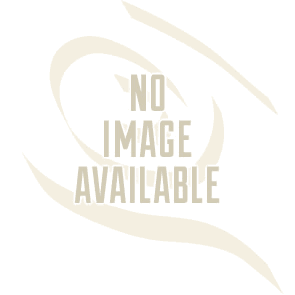 I believe this product will be useful in the future on many smaller projects. The only gripe I have is that getting the proper sand paper tension is more difficult than it should be. Well made tool. Would be nice to be able adjust the tension on the sanding cloth. I rcvd this in as fast a time as usual! Out of the box it was mostly easy to understand and prepare to use. I found it sort of difficult to get a length of sanding paper to fit the fron of the tool and get it taught. That is the way it is shown to use it. THe unit is easy to attach and holds the paper in place firmly though. I will keep trying to possibly cut a more correct length so it is easier to make the paper taught in the jaws. But is does work even without being taught. It works in my hands and also in a clamp on any of my tables. It will also work on some turnings as well. I recommend this as a good tool! If it had more flex it would be perfect. Still very useful and much easier to load than that "home made" alternatives. Needs improvement. I doubt I'll use it much. Great idea and well made, but the design wasn't ready for prime time. 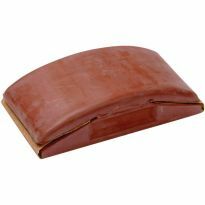 As noted by others, it is very difficult to get the sandpaper stretched tight. Because the teeth in the adjustable elbow are so big, it's a crap-shoot when first installing the sandpaper—one you will lose. While the installing isn't that hard, it's repeatedly having to take out one end of the sandpaper, trim it a bit, and roll the dice again that's the problem. It is hard to get paper tight. Getting the sand paper to the right length for a good tension is a real trial and error...Pain ! This is a piece of garbage. I challenge anyone to get this thing to tension. I acknowledge the design and need for a sanding belt, held in this way. It does not work ! I received this sanding bow as a gift, and haven’t been able to load a sanding strip properly. The design of the center handle adjustment teeth is poor. The teeth are too large to get an accurate adjustment. Maybe a serrated/sawtooth design foule have been better. If you have a half hour of spare time when changing grits, you will love the fight. I don’t have the packaging anymore, otherwise I’d return it to Rockler. I guess it’s a $20 tool that will sit unused in a drawer in my workshop. Disappointed customer. 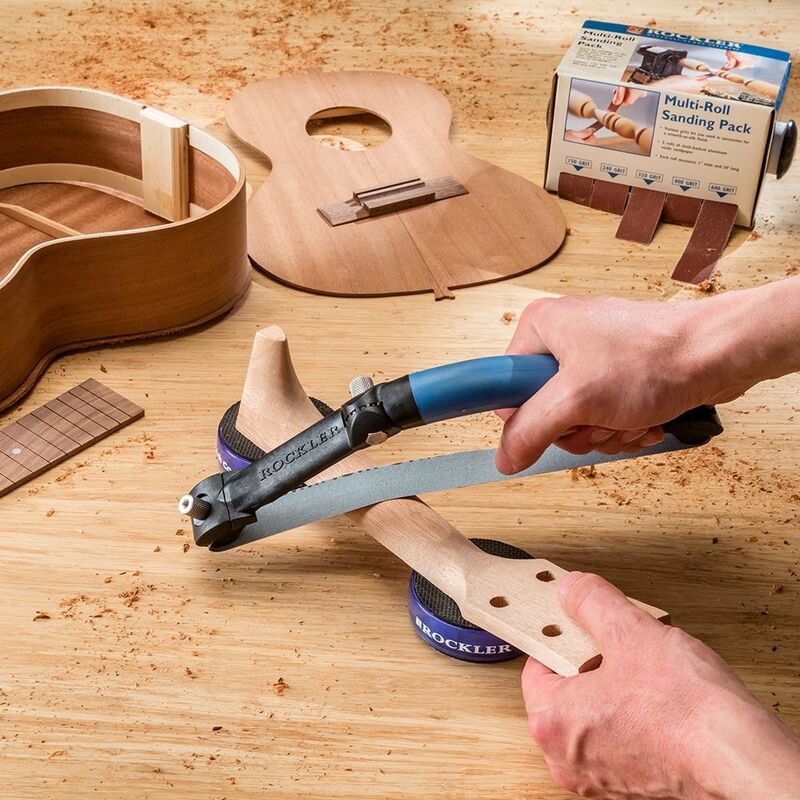 I’m usually impressed with Rockler’s ingenuity in design. I feel let down. if you like screwing around 15 to 20 minutes changing the sand paper you'll love it. pivot needs a clamp so the sand paper doesn't have to be cut so precisely. A friend has one and let me used it. I found it to very useful for my needs. Great tool. To see how it will work on my wood turning projects. Looks to be useful on old plate rail I'm refinishing. Have some sanding round many rounded rails and corners. Looks like it might assist c sanding furniture legs. You can actually sand an item using one hand while allowing your other hand to hold the item.. Need for sanding turned projects. I do a lot of hand sanding of curved surfaces so will see how this works. Hopefully well. Good choice for sanding in tight, tough spaces. This is my second Sanding Bow, having bought my first whilst on holiday in the US. The second Bow will allow me to use 180 grade in one and 320 in the other which will speed up work rather than having to change grades . If anyone is thinking about buying one, don’t think just order, they are a must in any workshop. My Son-in-Law is really into wood crafting and he can always use tools. Using this to sand the legs on our outside tables. Looks interesting for working with rounded surfaces, legs and such. Hope it is helpful. This is good tool for sanding peaces I turn on my lathe.. Gift for another woodworker who works with odd shapes. My wooden handle bow broke. Giving this a try. it was on my dad's christmas wish list. 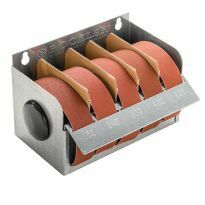 Can you use this on a lathe? BEST ANSWER: NO, it is not intended to be used on a lathe, that is considered a safety hazard.